Please, please! Old Navy! Stop these ridiculous mannequin ads! I DON'T want to know if that mannequin is "shopping for two". Please, just make it stop! Ok- so I am not the only one freaked out by those things? Ick. Glad to hear I’m not the only one that does not like those ads! They should make a horror movie with these. Very freakish. they drive me batty. I change the channel. Don’t know what their advertsing agency is thinking with this one!!!! Oh it does look awful. i know, right! I hate those ads. Yep! Even my 11 year old Grandson thinks the ads are stupid! You should have tried to shop for $1.00 flip-flops on Saturday. It was crazy. Or I should say the people who were waiting in line for 1 1/2 hours to pay were crazy! We left! Their flip-flops are only $2.50 any other day! Oh, I am totally with you on that!!! So funny you should mention that ‘cuz yesterday a friend & I were talking about the mannequins as we walked past an Old Navy. 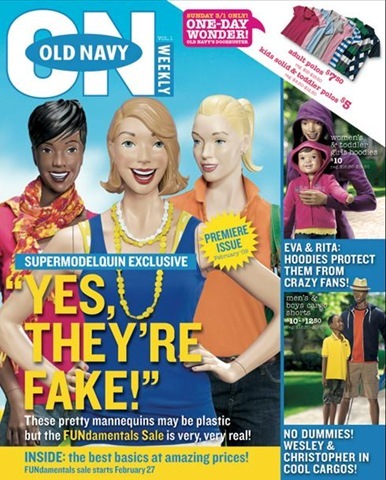 She said they didn’t want to pay real models hence the “dummies”. Mannequins in general freak me out…you know what I’m talking about if you went to department stores in the 60s. They looked freakishly real – esp. creepy were the children mannequins. I still remember that scary horror movie back then where the mad scientist took real people and put them into hot wax and turned them into mannequins…see, why I was always creeped out? lol. Ugh! So tacky- And quite eerie! They are kind of tacky but the commercials that really creeps me out is the King in the Burger King commercial. Is creepy selling these days? I so agree with you…it’s really creepy! I so agree. 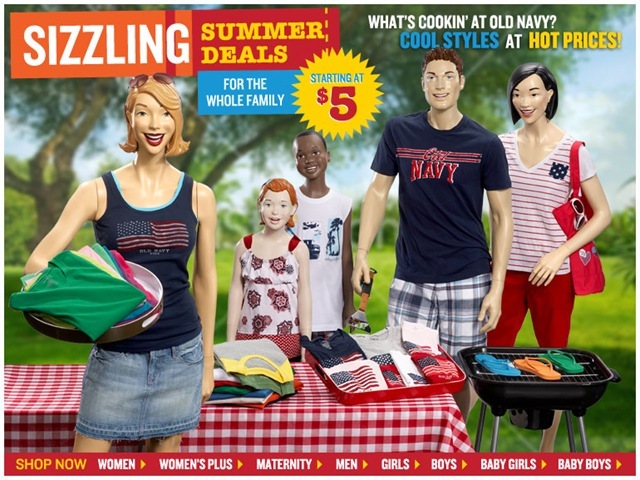 And what’s even scarier is that they have the same mannequins on display in the Old Navy stores. Wow, are they creepy! It is even creepier when you walk into the store and they are right in front of you. i totally agree….and you’re right, do we have to hear about shopping for two!